Take a look around your house and count how many pillows you own upon which you never rest your head. Got some decorative pillows on your couch? Extra pillows on your bed that end up on the floor every morning? Why not turn those useless unused pillows into storage spots? That's what any good covert prepper would do, and that's what I did. I devoted my very first prepper pillow to the storage of beans. At my local grocery store, I found a screamin' deal on pinto beans, with four-pound bags selling for $2. I figured I could fit two of these packages, totaling eight pounds of beans, into a typical ordinary decorative pillow. I went to my local thrift shop and purchased just such a pillow -- with a velcro opening -- for $2, leaving the polyester filling behind because I only wanted the pillowcase and somebody else might need the stuffing. I also bought a stack of about 20 pillowcases which are sold for 10 cents each. Not only am I storing beans in my prepper pillow, but I'm also storing pillowcases. Why? Watch the scene in "Gone with the Wind" when the southern belles are trying to come up with bandages for the hordes of wounded soldiers in Atlanta. What are they doing? Tearing sheets (and pillowcases) into strips. If you've got a baby in your household, or a wounded person, or an incontinent adult, while at the same time having no laundry services available, you're going to need as much clean cloth as possible. Pillowcases are great for many purposes, and pillows are a great place to store pillowcases without taking up precious closet space. First I taped the two sacks of beans together so they'd form a cohesive unit. I left them in their original plastic packaging because plastic "breathes" and beans need to breathe in order to stay viable. Then I stuck the beans in the bottom of a pillowcase, and then started adding more layers of pillowcases. I'd stop about every fifth pillowcase to pull them straight, even out all the creases, fold them over, and tape them down. 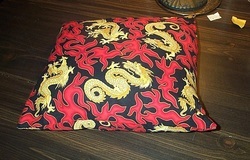 I don't want my finished pillow to be lumpy and I want to deter any possible insects or rodents. Every few layers, I'd add a dryer sheet because they are reputed to repel mice, and a couple of bay leaves, because they're supposed to deter bugs. Plus, they make the pillow smell good. By the time I had the bags of beans wrapped in about 20 successive layers of pillowcases, it was the perfect size package to stuff inside the decorative pillow. OK, I'm not crazy about the pattern of the pillow, but the size was right, the price was right, and the velcro opening was exactly right. I can always replace it later on when I find a decorative pillow I prefer. The pillow is now fairly dense and heavy but offers no visual clue of the secret it harbors. 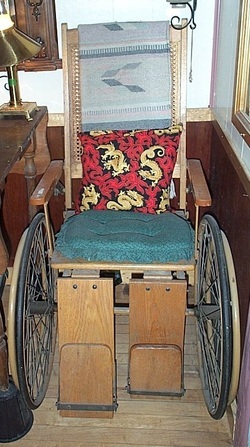 I can put in on a chair, on my couch, on a bed, or on my turn-of-the-century antique wheelchair (which I bought at a garage sale for $35). If I need a pillow to rest my head on, it would do OK. But it cost me a total of $8 and took me one hour to pack eight pounds of beans and 20 pillowcases into a space formerly occupied by a wad of polyester filling. I can do the same thing with white rice, flax seed, or dried corn. Are vandals and looters going to be searching my pillows for food? Probably not. Will I ever regret that I left a wad of polyester filling behind at the thrift shop? Probably not. Will I ever be totally happy that I have eight pounds of beans and 20 pillowcases available at my fingertips? Maybe so! After my town experienced a small earthquake, the newspaper was full of dire warnings about the "big one". Authorities announced that after a major quake, water service could be interrupted for up to three months. Digesting this information, I walked through a three-month cessation of water service in my imagination, concluding that one of the things I would miss most would be clean laundry. It occurred to me that I could mitigate a little bit of the hassle if I stockpiled clean laundry BEFORE the Big One. I started with undies, which can be purchased for ten cents each at a local thrift store. I collected them over the course of a few months, laundered them thoroughly, and then packed them in to a prepper pillow because I did not want them cluttering up my limited dresser space. This picture represents a two-month supply of clean undies -- 60 pair, for which I paid six bucks. Packed into a vacuum storage bag, they take up very little space -- just the right size for packing into a pillow. This is another good place to store extra pillowcases which can be used as rags, bags, diapers, or bandages in a really bad SHTF scenario. While I was at the thrift shop I stocked up on pillowcases, which also sell for a dime each. After adding a layer of about 15 pillowcases, I straightened them all out to get rid of creases and lumps, and then used packing tape to tape everything down and hold the package together. 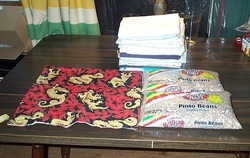 Wash cloths are easy to find for a nickel or a dime each at thrift shops and garage sales. If I'm going to be without laundry services for 3 months or longer, wash cloths would come in handy for dealing with babies, the sick, the injured, the elderly, and the incontinent. They can be used not only to clean things but also can serve as bandages or be used for feminine hygiene. So I collected wash cloths, and here is a stack of about 60 of them. They condense into a nice tidy packet inside a vacuum storage bag, and I'm now going to wrap the package in the usual many-layered pillowcase. After about 20 pillowcases, I straighten them out as before, wrap them around, and tape them down. Now my hand-stitched $2 pillow sham is nice and plump. It's a dense pillow, not as soft as my "real" (memory foam) pillow, but it's a very good way to store some things I might need after the "Big One" without taking up any of my limited storage space. If I didn't use the vacuum storage bags, I could just stuff things inside a pillowcase and stick it inside the pillow sham; the pillow would be much softer that way. However, my objective is to store the greatest amount of supplies in the smallest possible space (for the least amount of money) so I prefer the dense method of pillow prepping.